On Thursday, McDonald’s announced that it will start serving up one of its signature hamburgers using fresh beef next year, after four decades of using frozen patties. The move hasn’t had a huge impact on bank projections for the company’s stock price. But a group of equity analysts at Credit Suisse believe it could improve the firm’s image, which would be good news for same-store sales. “For overall US comps, we believe this initiative could drive an ~50bps lift in US SSS (beginning in 2H18),” the bank said in a note to clients Friday. The fresh beef announcement follows a number of other initiatives by McDonald’s to improve their image to shore up their share in a marketplace that is becoming more health conscious. In 2013 the firm announced they would target healthier options to children, and last year they made the switch to cage-free eggs for their breakfast sandwiches. 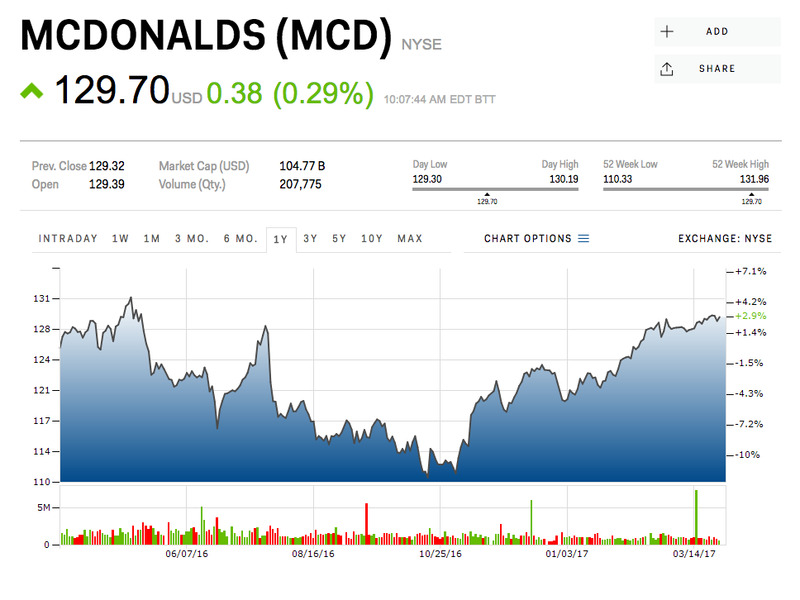 “We note this initiative also opens the door to further expansion in MCD’s use of fresh ingredients, which could lead to sales lifts in other products and further improvement in brand perception,” the bank said. But consumers viewing McDonald’s food quality in a better light would be bad news for one of their biggest competitors: Wendy’s. 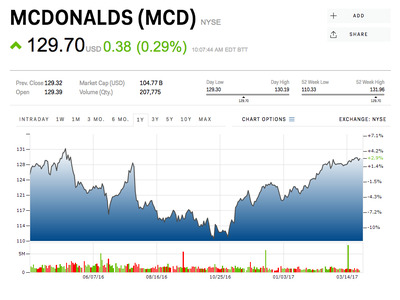 “We see [Wendy’s] as having the most to lose from MCD’s push into fresh beef, given the chain’s heavy reliance on fresh beef messaging as its primary point of differentiation,” the bank said. “But the fragmented nature of the US QSR market means the impact should be relatively muted, e.g., a 50bps lift in MCD’s US SSS = ~$US180mm in sales,” the bank added. The bank has a price target of $US137 per share for McDonald’s, above its current price of $US129.70 per share.